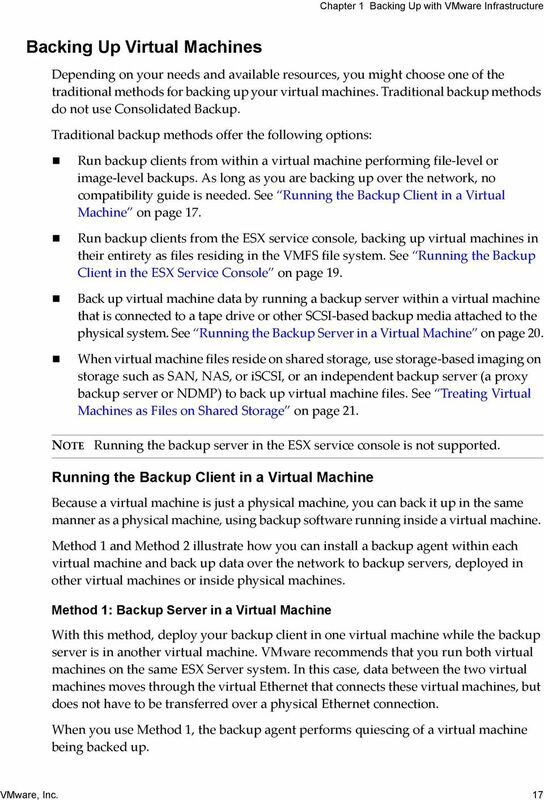 Download "Virtual Machine Backup Guide"
2 Virtual Machine Backup Guide You can find the most up-to-date technical documentation on the VMware Web site at: The VMware Web site also provides the latest product updates. If you have comments about this documentation, submit your feedback to: Copyright VMware, Inc. All rights reserved. This product is protected by U.S. and international copyright and intellectual property laws. VMware products are covered by one or more patents listed at VMware is a registered trademark or trademark of VMware, Inc. in the United States and/or other jurisdictions. All other marks and names mentioned herein may be trademarks of their respective companies. VMware, Inc Hillview Ave. Palo Alto, CA VMware, Inc.
4 Virtual Machine Backup Guide Configuring Networking on the VCB Proxy 35 Configuring Third Party Software on the VCB Proxy 35 Installing VMware Consolidated Backup 36 Installing a Backup Software Integration Module 36 Configuring VMware Consolidated Backup 37 Configuring USERNAME and PASSWORD 40 Enabling SSL Certificate Verification 41 Configuring SAN 43 Using VMware Consolidated Backup 43 Creating a VCB Helper Virtual Machine 44 Assigning Backup Privileges to a Consolidated Backup User 45 Creating a VMware Consolidated Backup User Role 45 Creating a VMware Consolidated Backup Proxy Role 46 Grouping Virtual Machines 47 Configuring Backup Jobs 48 First Time Backup 48 Quiescing Mechanisms 49 Using VMware VSS Components 50 Using SYNC Driver 51 Running Custom Quiescing Scripts 51 Advanced Configurations 53 Canceling a Backup Job 53 Cleaning Up After a Failed Backup Job 53 Upgrading Consolidated Backup 54 3 Restoration and Disaster Recovery 55 Restoring Virtual Machines Using VMware Consolidated Backup 55 Using VMware Converter to Restore Virtual Machine Images 56 Using the vcbrestore Utility to Restore Virtual Machines 56 Centralized Restore 56 Per Group Restore 57 Direct Restore to a Virtual Machine 57 Data Recovery 57 4 Backup Scenarios and Troubleshooting 59 Backup Usage Scenarios 59 Typical Consolidated Backup Usage Scenario 60 Troubleshooting 61 Changing Backup Policies after ESX Server 2.x Upgrades 61 Identifying VMFS Volumes in Backup GUI 61 4 VMware, Inc.
6 Virtual Machine Backup Guide 6 VMware, Inc.
8 Virtual Machine Backup Guide Intended Audience This manual is intended for anyone who wants to perform backup and restore tasks using VMware Infrastructure. The information in this manual is written for experienced Windows or Linux system administrators who are familiar with virtual machine technology and datacenter operations. Document Feedback VMware welcomes your suggestions for improving our documentation. If you have comments, send your feedback to: VMware vsphere Documentation The VMware vsphere documentation consists of the combined VMware vcenter Server and ESX/ESXi documentation set. Abbreviations Used in Figures The figures in this book use the abbreviations listed in Table 1. Table 1. Abbreviations Abbreviation database datastore dsk# hostn SAN tmplt user# VC VM# Description VirtualCenter database Storage for the managed host Storage disk for the managed host VirtualCenter managed hosts Storage area network type datastore shared between managed hosts Template User with access permissions VirtualCenter Server Virtual machines on a managed host 8 VMware, Inc.
10 Virtual Machine Backup Guide 10 VMware, Inc.
12 Virtual Machine Backup Guide Incremental backup. Backs up only files that have changed since the last backup, whether it is a full or incremental backup. Quiescing. A process of bringing the on disk data of a physical or virtual computer into a state suitable for backups. This process might include such operations such as flushing dirty buffers from the operating systemʹs in memory cache to disk, or other higher level application specific tasks. VCB proxy. In the context of VMware Consolidated Backup, VCB proxy is a physical or virtual machine running Microsoft Windows Server, Consolidated Backup, and third party backup software. Used to perform file level and image level virtual machine backups. 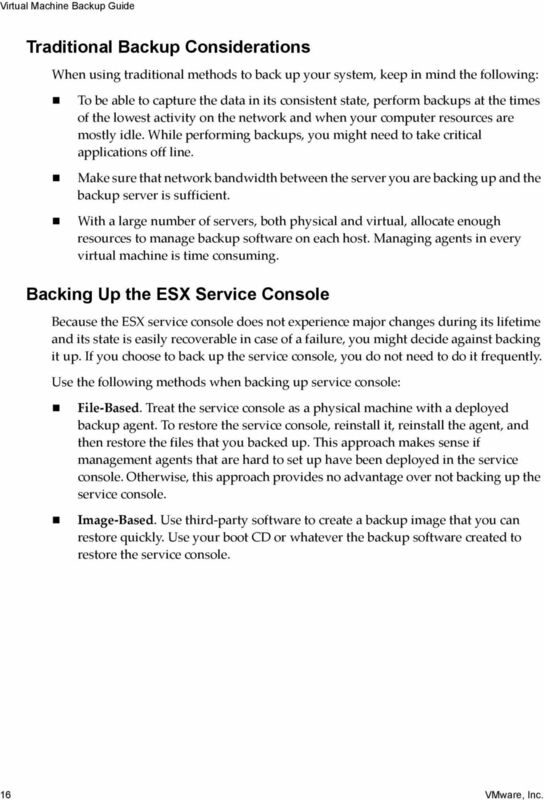 What to Back Up Within the ESX Server environment, you need to back up the following major items: Virtual machine contents. The virtual machine data you back up can include virtual disks or Raw Device Mappings (RDMs), configuration files, and so on. As with physical machines, you must back up virtual machine data periodically to prevent its potential damage and loss due to human or technical errors. Generally, use the following backup schedule for your virtual machines: At the image level, perform backups periodically for Windows and nightly for Linux. For example, back up a boot disk image of a Windows virtual machine once a week. At the file level, perform backups once a day. For example, back up files on drives D, E, and so on every night. For information on how to work with the files, see Accessing and Managing Virtual Disk Files on page 13. Service Console (ESX Server 3 and ESX 4 only). The service console, a customized version of Linux, is the ESX command line management interface. It provides tools and a command prompt for more direct management of ESX. With the VI Client or vsphere Client being the main interface to the ESX host, use the service console to perform only advanced administration operations. NOTE ESX 4i and ESX Server 3i do not have a service console. During its lifetime, the service console does not experience any major changes other than periodic upgrades. In case of a failure, you can recover the state of your service console by reinstalling ESX. If you decide to back up the service console, you do not need to back it up as frequently as the virtual machines and their data. 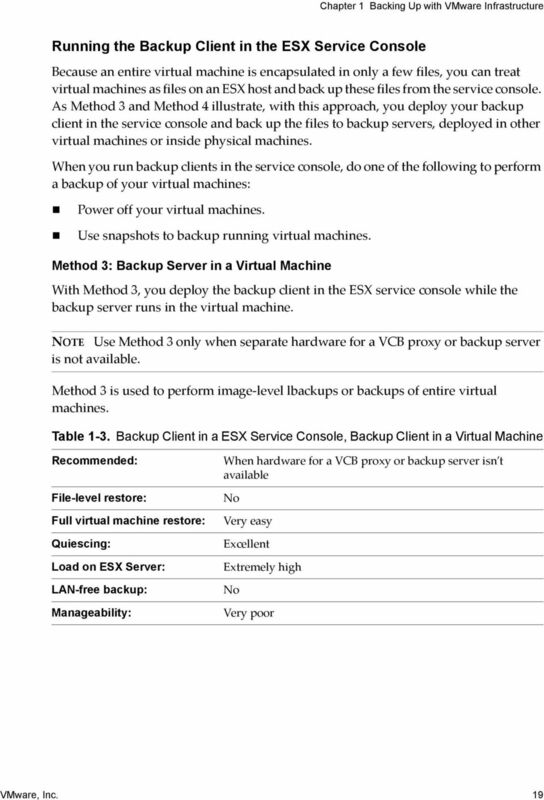 12 VMware, Inc.
14 Virtual Machine Backup Guide NOTE In Linux, importing a large disk from a Common Internet File System (CIFS) mount stalls the ESX Server host. If this happens, your host must be rebooted. Move large files from the service console to tape backup. To do this effectively, use supported programs with no known issues. As a workaround, use smbclient to copy the large file onto a local directory on the service console and import from there. Additional file operations are enabled through the vmkfstools command. Use this command to perform the following: Creating, extending, and deleting disk images. Importing, exporting, and renaming disk images. Setting and querying properties of disk images. Creating and extending a VMFS file system. 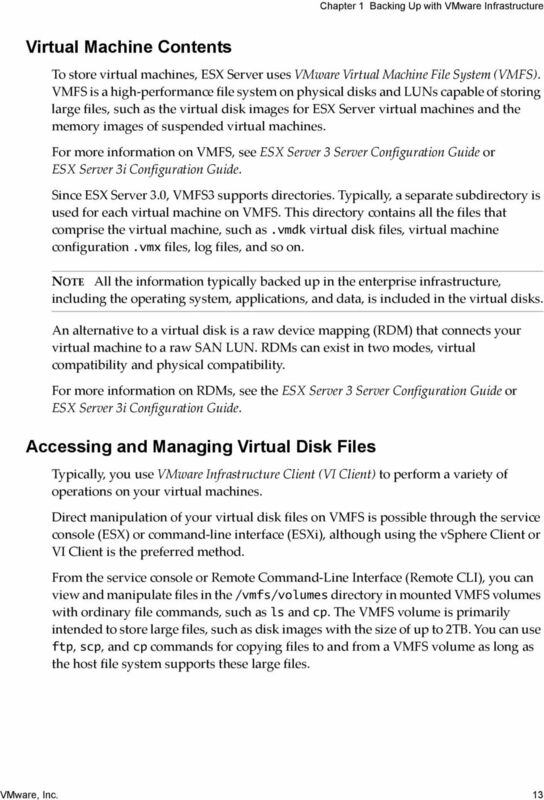 For more information on the vmkfstools command, see the ESX Server 3 Server Configuration Guide or ESX Server 3i Configuration Guide. Backup Components and Approaches When you perform a backup, the following three components of backup software are involved in the process: Backup Client (Backup Agent). A program that scans virtual machine file systems and transfers data to be backed up to a backup server. During restore operations, the backup client writes the data into the file systems. Backup Server. A program that writes the data, pushed by the backup client, to a backup medium, such as a robotic tape library. During restore operation, the backup server reads the data from the backup medium and pushes it to the backup client. Scheduler. A program that allows you to schedule regular backup jobs and coordinate their execution. You can schedule backups at periodic intervals, or you can schedule individual files to be backed up immediately after they have been updated. Each of the backup software components can be run in a virtual machine, on the service console (only with ESX), or on a VCB proxy running Microsoft Windows Server. While the location of the scheduler is not important, the locations of the backup server and backup client are important. 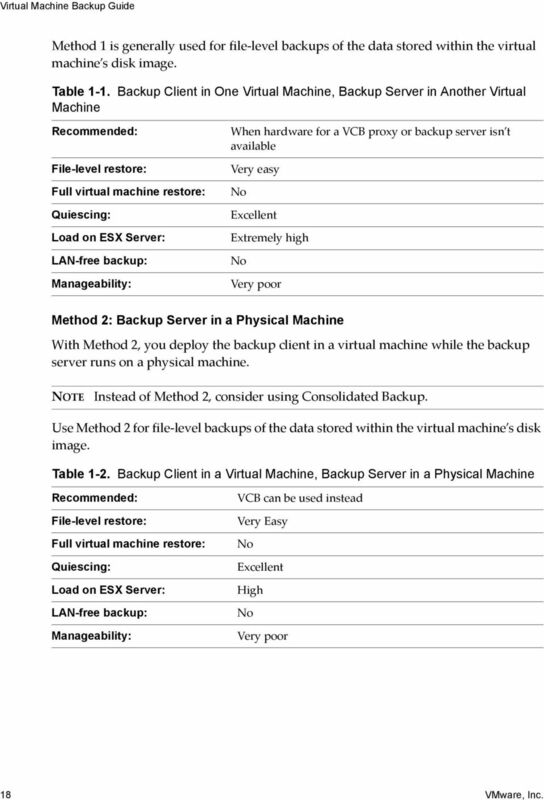 14 VMware, Inc.
16 Virtual Machine Backup Guide Traditional Backup Considerations When using traditional methods to back up your system, keep in mind the following: To be able to capture the data in its consistent state, perform backups at the times of the lowest activity on the network and when your computer resources are mostly idle. While performing backups, you might need to take critical applications off line. Make sure that network bandwidth between the server you are backing up and the backup server is sufficient. With a large number of servers, both physical and virtual, allocate enough resources to manage backup software on each host. Managing agents in every virtual machine is time consuming. Backing Up the ESX Service Console Because the ESX service console does not experience major changes during its lifetime and its state is easily recoverable in case of a failure, you might decide against backing it up. If you choose to back up the service console, you do not need to do it frequently. Use the following methods when backing up service console: File Based. Treat the service console as a physical machine with a deployed backup agent. To restore the service console, reinstall it, reinstall the agent, and then restore the files that you backed up. This approach makes sense if management agents that are hard to set up have been deployed in the service console. Otherwise, this approach provides no advantage over not backing up the service console. Image Based. Use third party software to create a backup image that you can restore quickly. Use your boot CD or whatever the backup software created to restore the service console. 16 VMware, Inc.
18 Virtual Machine Backup Guide Method 1 is generally used for file level backups of the data stored within the virtual machine s disk image. Table 1-1. Backup Client in One Virtual Machine, Backup Server in Another Virtual Machine Recommended: File-level restore: Full virtual machine restore: Quiescing: Load on ESX Server: LAN-free backup: Manageability: When hardware for a VCB proxy or backup server isn t available Very easy No Excellent Extremely high No Very poor Method 2: Backup Server in a Physical Machine With Method 2, you deploy the backup client in a virtual machine while the backup server runs on a physical machine. NOTE Instead of Method 2, consider using Consolidated Backup. Use Method 2 for file level backups of the data stored within the virtual machine s disk image. Table 1-2. Backup Client in a Virtual Machine, Backup Server in a Physical Machine Recommended: File-level restore: Full virtual machine restore: Quiescing: Load on ESX Server: LAN-free backup: Manageability: VCB can be used instead Very Easy No Excellent High No Very poor 18 VMware, Inc.
20 Virtual Machine Backup Guide Method 4: Backup Server in a Physical Machine With Method 4, you deploy the backup client in the ESX service console while the backup server runs on a physical machine. NOTE Instead of Method 4 consider using Consolidated Backup. Method 4 is used to perform image level backups. Table 1-4. Backup Client in an ESX Service Console, Backup Server in a Physical Machine Recommended: File-level restore: Full virtual machine restore: Quiescing: Load on ESX Server: LAN-free backup: Manageability/Scalability: VCB can be used instead. No Very Easy Excellent High No Very poor Running the Backup Server in a Virtual Machine (SEE UPDATE) You can back up virtual machine data by running a backup server within a virtual machine that is connected to a tape drive or other SCSI based backup media attached to the physical system. When using this method, keep in mind the following: VMware supports attaching SCSI drives to the ESX Server using Adaptec SCSI adapters. Using other adapters, such as LSI MPT Fusion SCSI, is not supported. If you are using a tape drive library (versus using a stand alone tape drive), the library must be multitarget, and not multi LUN. Set the tape drive s virtual target ID in the virtual machine s configuration to be the same as the physical target ID. For information on attaching a SCSI based tape drive to your virtual machine, see Basic System Administration. 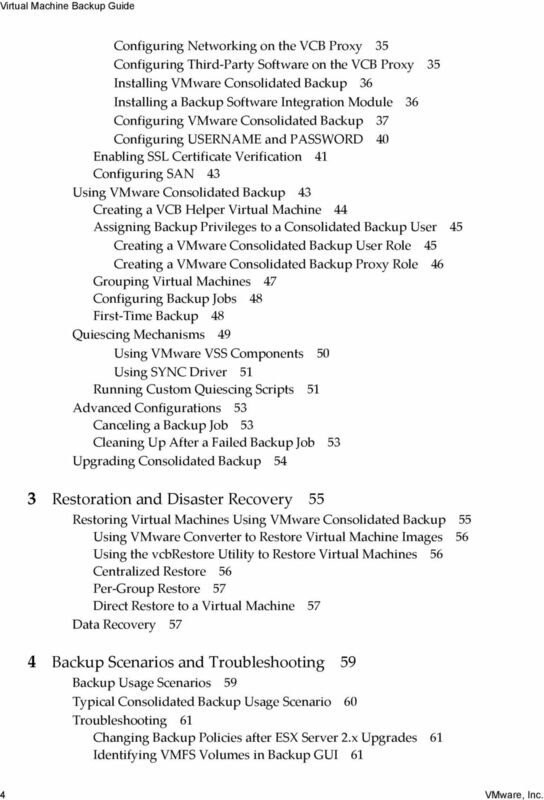 20 VMware, Inc.
22 Virtual Machine Backup Guide Using VMware Consolidated Backup In a modern datacenter environment, preforming traditional backups might cause problems, some of which are described in Traditional Backup Considerations on page 16. To avoid many of the problems, consider using VMware Consolidated Backup. VMware Consolidated Backup addresses most of the problems you encounter when performing traditional backups. Consolidated Backup helps you to: Reduce the load on your ESX Server systems by moving the backup tasks to one or more dedicated backup proxies. NOTE To take advantage of the Consolidated Backup offloading capabilities, you are required to use Fibre Channel or iscsi SAN for your virtual machine data. Eliminate the need for a backup window by moving to a snapshot based backup approach. Simplify backup administration by making optional the deployment of backup agents in each virtual machine you back up. Back up virtual machines regardless of their power state. 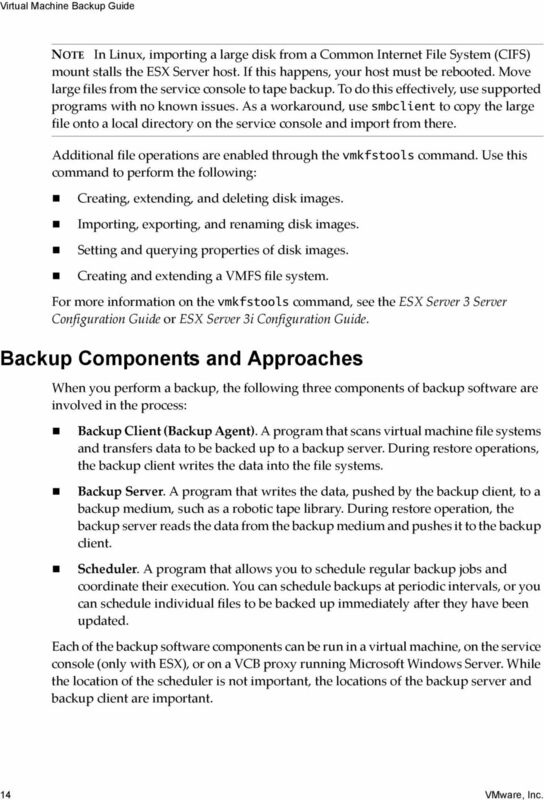 22 VMware, Inc.
24 Virtual Machine Backup Guide The following are the key features of Consolidated Backup: Most major backup applications integrate with Consolidated Backup providing you with a fast and efficient way of backing up data in virtual machines. Consolidated Backup eliminates the need for having a backup agent installed in each virtual machine you want to protect. Consolidated Backup can read virtual disk data directly from your SAN storage device using Fibre Channel or iscsi, or through the ESX Server I/O stack or use a network connection to an ESX Server host to access virtual disk data. Consolidated Backup can run in a virtual machine. Consolidated Backup supports file level full and incremental backups for virtual machines running Microsoft Windows operating system and image level backups for virtual machines running any operating system. You can use Consolidated Backup against a single ESX Server host or with a VirtualCenter Server that manages a number of ESX Servers. How VMware Consolidated Backup Works Consolidated Backup consists of a set of utilities and scripts that work in conjunction with a third party backup software. To ensure that Consolidated Backup works with the specific backup software, either VMware or your backup software vendor provide integration modules containing any required pre backup and post backup scripts. The third party software, integration module, and Consolidated Backup run on the VCB proxy, a physical or virtual machine that has Microsoft Windows operating system installed. For specific versions of Microsoft Windows, see Configuring Windows on the VCB Proxy on page 34. VMware Consolidated Backup Usage Models To store and manage virtual disk files, ESX Server uses a variety of physical storage devices, including local disks, NAS storage, Fibre Channel SANs, or iscsi SANs. 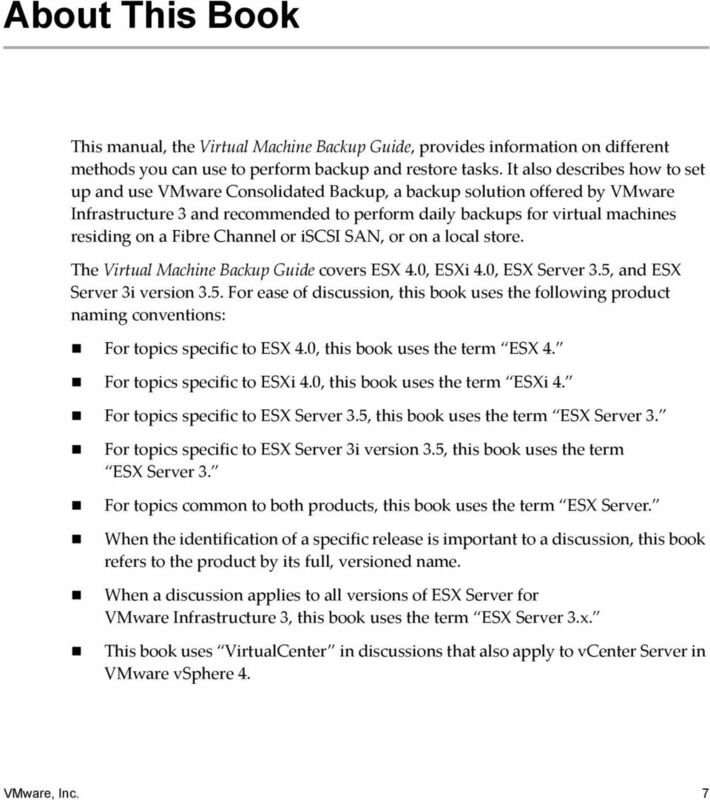 For information on different types of storage, see the ESX Server 3 Configuration Guide, ESX Server 3i Configuration Guide, ESX Configuration Guide, or ESXi Configuration Guide. The type of storage device your ESX Server system has access to determines how you set up the VCB proxy and the transportation method Consolidated Backup uses to access virtual disk data. 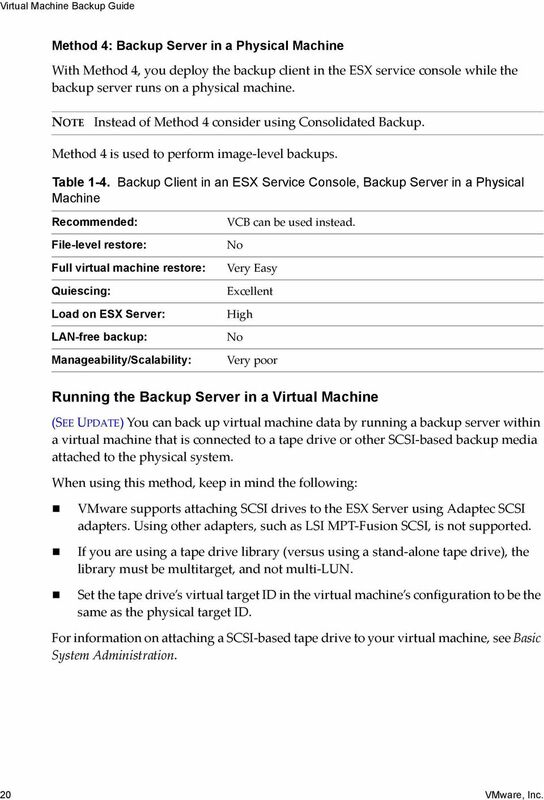 24 VMware, Inc.
26 Virtual Machine Backup Guide SCSI Hot-Add Mode In the SCSI Hot Add mode, you set up one of your virtual machines as a VCB proxy and use it to back up other virtual machines residing on storage visible to the ESX Server that hosts the VCB proxy virtual machine. This mode eliminates the need of having a dedicated physical machine for your VCB proxy and does not require you to expose SAN LUNs to the Windows VCB proxy. In this mode, you can use Consolidated Backup to protect any virtual disks on any type of storage available to your ESX Server host, including NAS or local storage. (SEE UPDATE) The only exception is that it does not back up any disks of the virtual machine that has any independent disk, Physical Compatibility RDM, or IDE (This is applicable to ESX 4 and ESXi 4.) Consolidated Backup creates a snapshot of the virtual disk to be protected and hot adds the snapshot to the VCB proxy, allowing it to access virtual machine disk data. The VCB proxy reads the data through the I/O stack of the ESX host. Figure 2-2. VMware Consolidated Backup in the Hot-Add Mode LAN ESX Server virtual machine VMware Tools ESX Server VCB Proxy virtual machine backup software integration module shared storage network Consolidated Backup virtual machine VMware Tools shared storage virtual disk VMFS local storage virtual disk VMFS To be able to run Consolidated Backup in the SCSI Hot Add mode: You need to have ESX Server 3.5 or ESX Server 3i version 3.5 or later. If you are using only the local storage devices, you need a VCB proxy virtual machine on each ESX Server host. If you are using VirtualCenter, make sure to have version 2.5 or later installed. 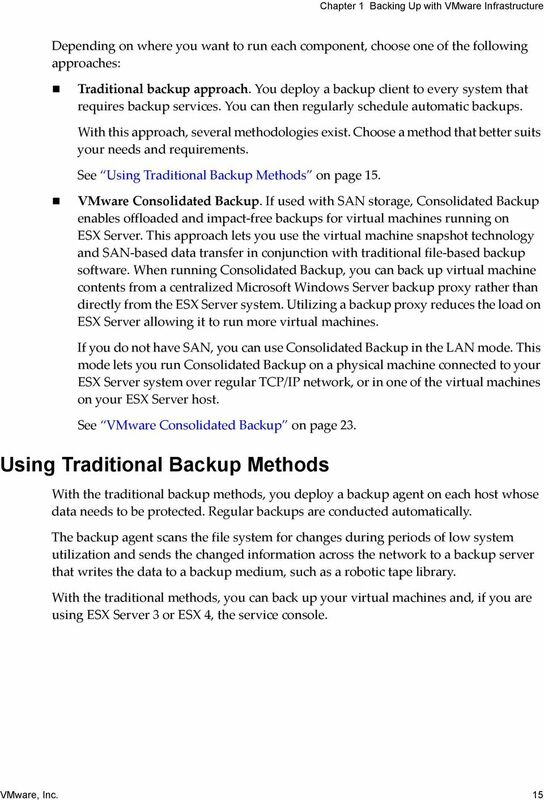 26 VMware, Inc.
28 Virtual Machine Backup Guide Because the virtual disk data is transferred from the ESX Server host across the LAN, this mode does not provide the LAN free capabilities of the SAN mode. However, running Consolidated Backup in the LAN mode offers you the following advantages: You are not required to store virtual disks on a SAN. You can use any storage device, including NAS, that ESX Server can access. You are not required to have a dedicated physical server for your VCB proxy. In addition to setting up a physical server as the VCB proxy, you have an option of configuring one of your virtual machines as the VCB proxy. While this configuration does not completely off load backup processes from the ESX Server host, it still has an advantage over using a backup agent in the service console or in the production virtual machine. You can use the advanced resource scheduling capabilities of VMware Infrastructure to prevent the virtual machine running your backups from impacting the performance of your production workloads. For example, you can put the virtual machine performing your backups and your production virtual machines in different resource pools. See the Resource Management Guide. If your ESX Server host and the VCB proxy are on a secure isolated network, you can use an unencrypted data transfer, which is faster and takes less resources of the ESX Server host and the proxy. When you need to protect sensitive information, you have an option of transferring virtual machine data in an encrypted form. VMware Consolidated Backup Workflow Before using Consolidated Backup, you need to configure and schedule a backup job for each virtual machine or a group of virtual machines. At the scheduled time, the backup software starts the backup job on the VCB proxy. When the backup job is launched, the following steps take place: 1 The backup software calls the pre backup script, which performs these tasks: a (Optional) Runs your custom pre freeze script in the virtual machine. The pre freeze script prepares the critical software components in the virtual machine for a backup. See Running Custom Quiescing Scripts on page 51. b Quiesces the virtual machine. See Quiescing Mechanisms on page 49. c Puts the virtual machine into snapshot mode. Changes to virtual disks are stored for later writing. The virtual machine can continue to operate during this process. d Unquiesces the virtual machine that was quiesced in Step b. 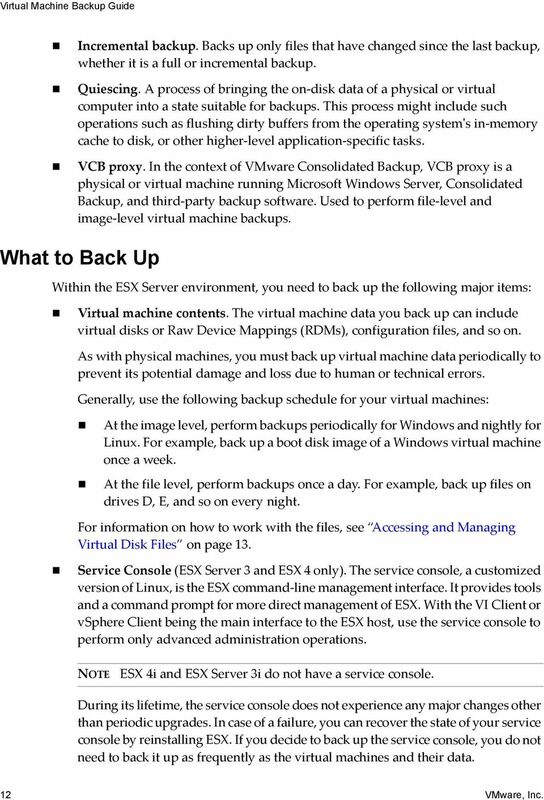 28 VMware, Inc.
30 Virtual Machine Backup Guide Performing Image-Level Virtual Machine Backups An image level virtual machine backup is operating system neutral and can be performed regardless of the guest operating system. When you run the image level virtual machine backup, Consolidated Backup first creates a snapshot of your virtual machine. Then the following steps take place: 1 Consolidated Backup exports the virtual machine snapshot to a local directory on the VCB proxy. For example: C:\mnt\mytestvm.foo.com-fullVM 2 The third party backup software picks up the virtual machine disk images and configuration files and moves them to the backup medium. Performing File-Level Virtual Machine Backups For virtual machines running Windows, Consolidated Backup supports file level backups. When you run file level backups, you first create a snapshot of your virtual machine. Then the following steps take place: 1 Consolidated Backup discovers volumes within virtual machine snapshots and mounts discovered volumes on the VCB proxy at predefined junction points. Each junction point corresponds to a drive letter assigned to each volume in the virtual machine. For example: C:\mnt\mytestvm.foo.com\letters\D CAUTION Because the VCB proxy can recognize only volumes that have drive letters assigned to them, make sure that each volume on a virtual disk has a drive letter. 2 The third party backup software makes file level backups from these volumes. VMware Consolidated Backup Limitations Under certain circumstances, you cannot use Consolidated Backup for backing up data in a virtual machine. Consolidated Backup in SAN mode cannot back up virtual machines with disk images stored on a storage device that the VCB proxy cannot access. Consolidated Backup cannot back up RDMs in physical compatibility mode. 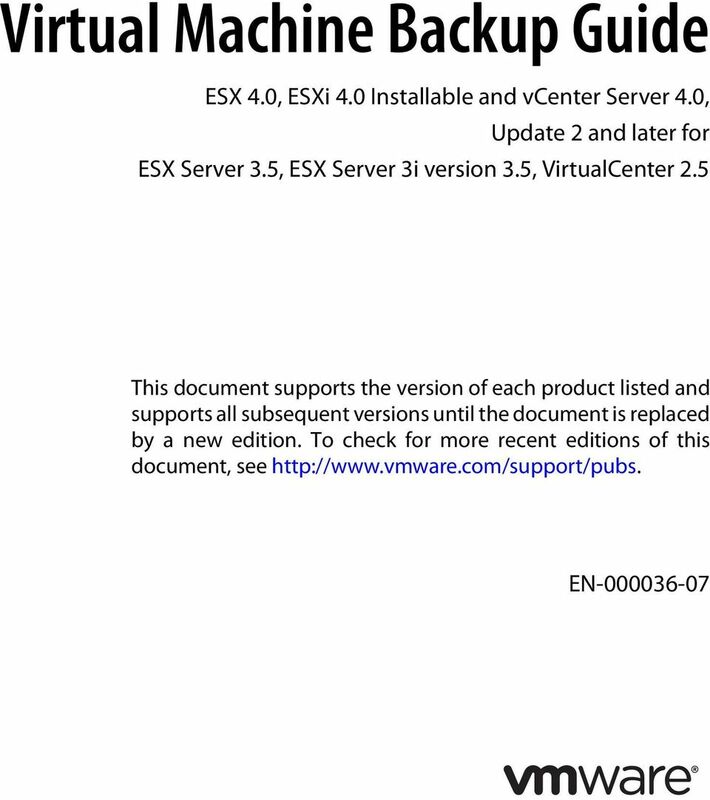 30 VMware, Inc.
32 Virtual Machine Backup Guide Backup software that supports Consolidated Backup. 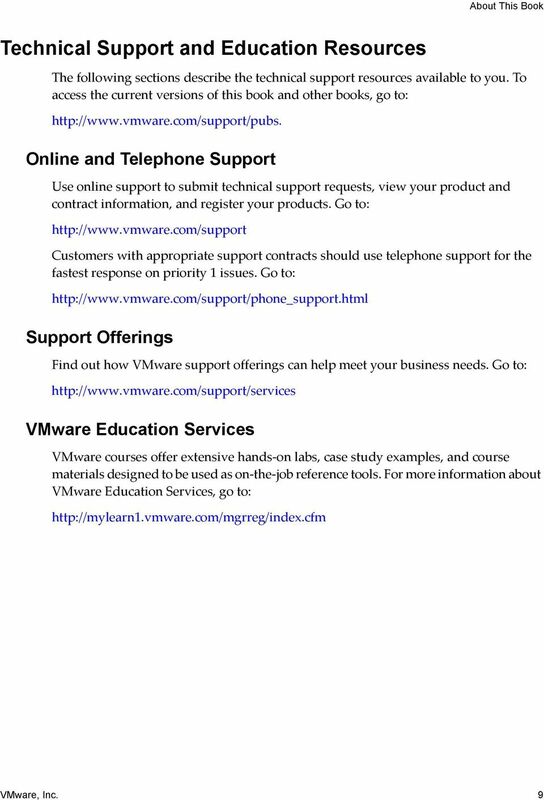 For a list of supporting third party backup packages, see the VMware Infrastructure 3 Backup Software Compatibility Guide. NOTE If you use Consolidated Backup in conjunction with a VMware supported third party software, make sure that the versions of Microsoft Windows and your backup software match. For example, if you run the 64 bit version of Microsoft Windows, install the 64 bit version of the backup software. Network adapter (NIC). To use Consolidated Backup in the SAN mode, additional requirements include: Fibre Channel or iscsi SAN storage hosting virtual machines you plan to back up. If you use Fibre Channel SAN, you can use a dedicated physical system for a VCB proxy with a Fibre Channel host bus adapter (HBA) installed or use a virtual machine as VCB proxy. Setting Up VMware Consolidated Backup Follow these steps to configure all the components that work with Consolidated Backup: 1 Configure your ESX Server or multiple servers. See Configuring VMware ESX Server and Virtual Machines on page Set up your VCB proxy and install your backup software, Consolidated Backup, and corresponding integration module on the VCB proxy. See Setting Up a VCB Proxy on page If needed, enable SSL certificate verification. See Enabling SSL Certificate Verification on page If you use SAN, configure your SAN fabric. See Configuring SAN on page 43. Configuring VMware ESX Server and Virtual Machines You should have an existing ESX Server host or multiple ESX Server hosts and VirtualCenter to manage them. 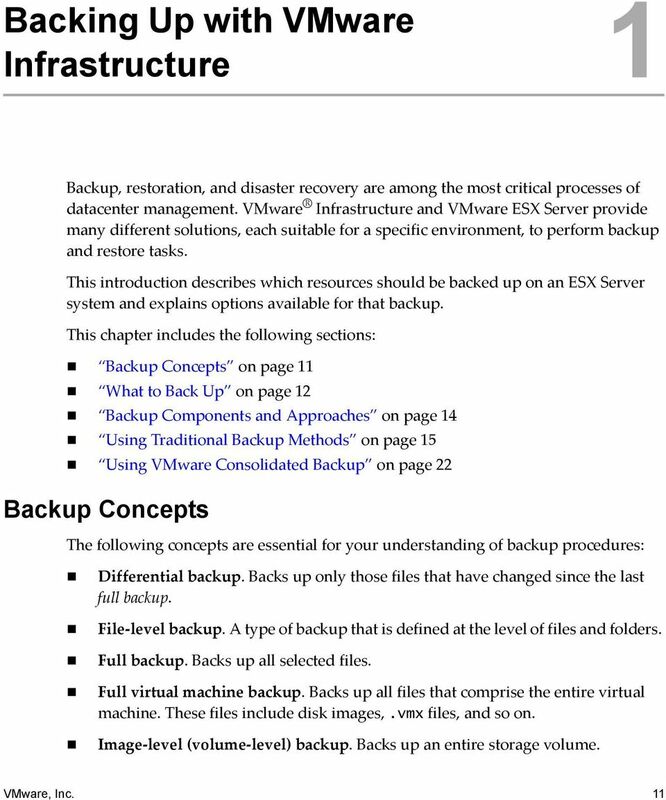 32 VMware, Inc.
34 Virtual Machine Backup Guide 4 Install Consolidated Backup. See Installing VMware Consolidated Backup on page Install an integration module corresponding to your third party backup software. See Installing a Backup Software Integration Module on page Configure Consolidated Backup. 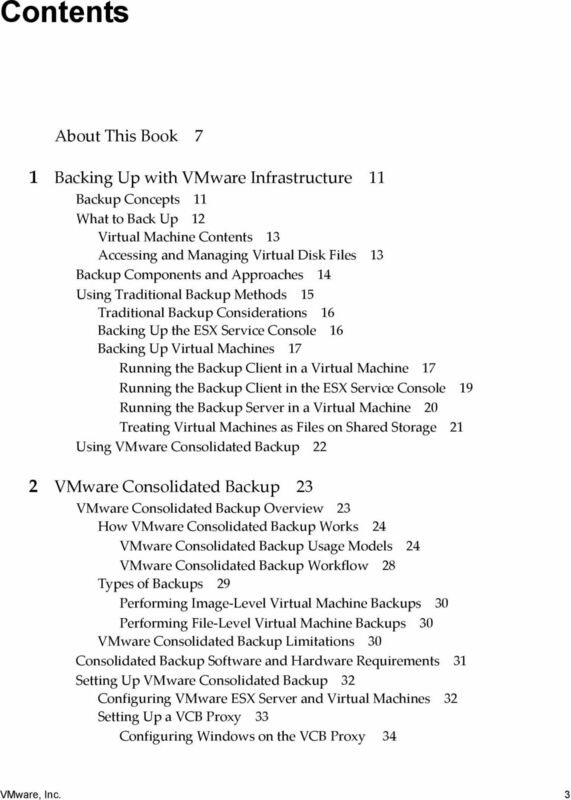 See Configuring VMware Consolidated Backup on page 37. Configuring Windows on the VCB Proxy On your VCB proxy, install a supported version of Microsoft Windows. See Consolidated Backup Software and Hardware Requirements on page 31. All versions of Windows, except Windows Server 2003 Enterprise Edition and Windows Server 2003 Datacenter Edition, assign drive letters to each visible new technology file system (NTFS) and file allocation table (FAT) volumes. To be able to use Consolidated Backup, you need to clear any unused drive letter assignments. CAUTION If you do not perform this configuration step, data corruption for virtual machines using RDM can occur. To disable assignment of drive letters 1 Shut down the VCB proxy. 2 Disconnect the VCB proxy from the SAN or mask all the LUNs containing VMFS volumes or RDMs. 3 Boot the proxy and log in as administrator. 4 Open a command line interface. 5 Run the Diskpart utility by typing: diskpart The Diskpart utility starts up and prints its own command prompt. 6 Disable automatic drive letter assignment to newly seen volumes by typing at the Diskpart command prompt: automount disable 7 Clean out entries of previously mounted volumes in the registry by typing at the Diskpart command prompt: automount scrub 34 VMware, Inc.
VMware Data Recovery Administration Guide Data Recovery 1.2 This document supports the version of each product listed and supports all subsequent versions until the document is replaced by a new edition. VMware Data Recovery Administration Guide Data Recovery 2.0 This document supports the version of each product listed and supports all subsequent versions until the document is replaced by a new edition. Acronis Backup & Recovery 11 Virtual Edition Backing Up Virtual Machines Copyright Acronis, Inc., 2000-2011. All rights reserved. 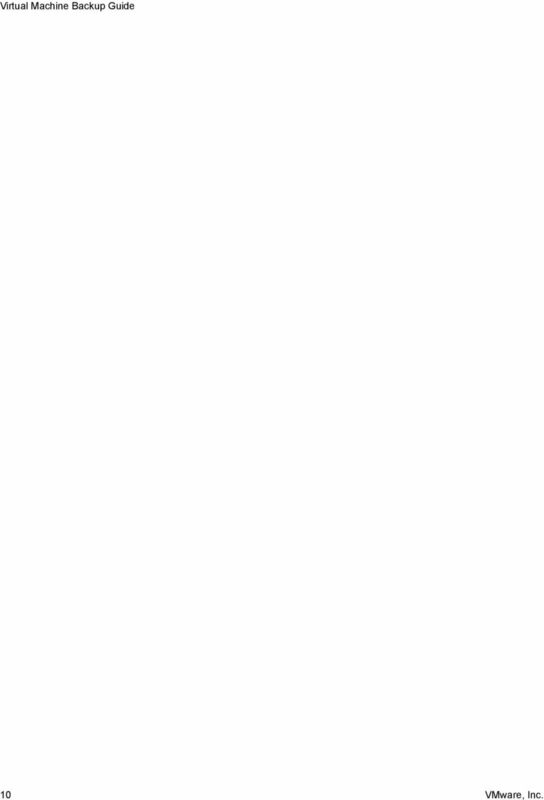 Acronis and Acronis Secure Zone are registered trademarks of Acronis, Inc.